You know that shocks are what control how your car rides, but what’s actually going on inside the tube of a high-performance off-road shock? I took some apart and put them back together (with some engineers who know what they’re doing) to find out. Let’s go ahead and skip over about a century of technological progress to consider today’s coilover, a keystone of modern high-performance suspension in both road and off-road applications. It’s a fluid-filled cylinder with a spring coil wrapped around it. Hence– Coil. Over. The cylinders are generally threaded like giant bolts, allowing you to screw-down the spring to adjust the ride height. Most other suspension setups use a separate shock and spring, or stacks of skinny steel strips known as “leaf springs,” or a combination of those. What makes the coilover a better option is its durability, adjustability and theoretical immortality– good ones can be rebuilt and re-filled with fluid as they wear out. Generally speaking, a coilover is an easily bolted-in upgrade for a car or truck with a standard, modernish shock-and-spring setup. The coilover’s spring does the job of taking most of the vehicle’s raw weight. The spring’s ...springiness... largely determines the whole car’s ride height and the rate of shock absorption to a point, but the nuance of that job is handled mostly by the valving inside the shock cylinder itself. The shock cylinder has more than just fluid inside it—it houses a piston that pumps the juice up and down against impacts from whatever you’re driving over. Of course the rate of compression and rebound has to be variable depending on the force of an impact. Your shocks need to squeeze a little over a little bump or a lot over a big bump. And the way shocks do this comes down to valving. That is, there’s a stack of shims with holes in them that dictate the rate and volume at which hydraulic fluid moves up and down inside the shock. For the sake of simplicity and saving money, the hardware of quality coilovers is often interchangeable between makes and models. The same cylinder and spring might work for a Tacoma and a 4Runner, but the mounting points can be easily changed and internal valving optimized for each application. That modularity also significantly prolongs a coilover’s viable life. When they wear out, the internals can be replaced and fluid re-filled to effectively revive the shock. The two major challenges shocks fight against are heat and effective range across conditions. The sheer large volume of aftermarket cylinders, high-quality fluid inside them, and remote reservoirs holding that fluid are how engineers keep coilovers cool. Keeping the shock functioning as well over soft conditions as hard comes back to valving. He’s referring to how significant a shock’s valving is to providing performance you can use off-road and on. Different springs can dramatically change your vehicle’s look by making it higher or lower, but the microscopic changes in fluid-flow inside the shocks do a lot more for actual performance. And more significantly, they’re critical if you want to balance performance across a range of conditions. For our investigation inside these mysterious coilovers to see how they’re valved, we went to AFE Power. It’s named for “Advanced Flow Engineering” and while the outfit has built itself up making air intake and exhaust upgrades, it’s diving into suspension with a new AFE Control division based in part off the recently acquired the Sway-A-Way suspension company. While AFE is relatively new to selling suspension, Sway-A-Way has been at it for years and brought a baseline for AFE to build off for many common vehicles, both cars and trucks. Leighton told me Toyota trucks were far and away the highest-demand application for their off-road suspension upgrades. The AFE techs were kind enough to dig a pair of old Toyota truck coilover cylinders out of their recycling bin and rebuild them for me so we could walk through the process and see what they actually look like dissected. Here’s an overview of how a ‘raw’ used shock is set up for a specific truck. First the spring has to be removed. This is the scariest part since that wind of steel is under a lot of pressure. You can borrow a spring compressing hand tool from your local auto parts store, but the AFE shop had this significantly fancier one to make light work of the task. With the spring out of the way the piston can be opened up. These Sway-A-Ways had three little bolts holding it down. Pulling that up exposes the valving stack– effectively, where all the shock’s magic happens. The fluid will flow through those little holes you can just see behind the lock nut, and around the washers. On the other side of the shock cylinder, this cap is being swapped out so the shock can be mounted to a different vehicle. After releasing the nitrogen (used to help force fluid through the holes) from inside, it can still take a whole lot of leverage to get one of these off. Note the gigantic wrench. We had some help from a torch eventually. Now back to part that matters most– the valving stack. A rebuilder will remove a locking nut to get at the series of flexible and bored-out shims that regulate the shock’s fluid-pulsing rate. Each vehicle has a unique valving configuration, so it’s very important to make sure these shims are put on in the right order. AFE has diagrams from Sway-A-Way to help put the parts in the right order for specific vehicles. Replacing these parts is not always necessary in a shock rebuild; it’s mostly the seals and rings that crack over time, but an expert would be able to tweak the shock’s performance properties by making changes to this little stack of steel bits. AFE has this “stack assembly table” for neatly organizing a large quantity of valving stacks without getting the shims mixed up. 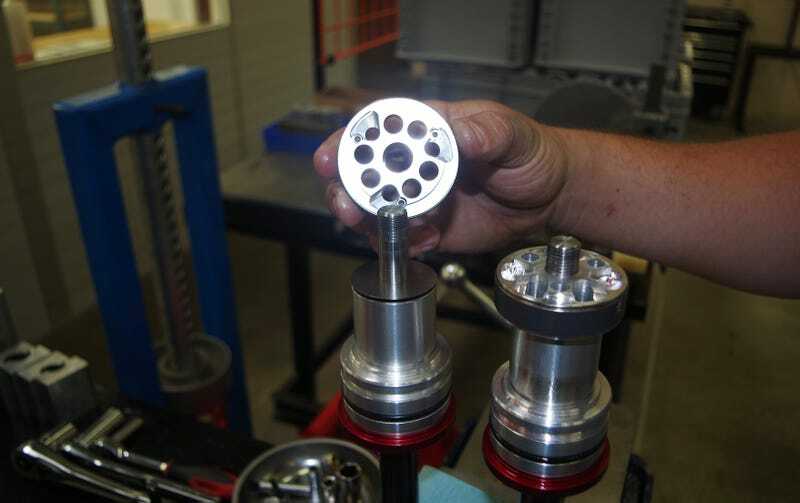 A technician references the manual of whatever vehicle they’re prepping shocks for, then simply finds the right valves in their little labeled drawers and mounts them on these studs before putting them into a shock cylinder. The piston is installed with the desired valving stack, fluid is added, and the cylinder’s guts get squeezed back together. Finally the appropriate springs have to be fitted and the preload set to determine the vehicle’s ride height. Part of the shock cylinder is threaded to make exactly that adjustment, and the bottom cap is screwed on to keep the spring attached to the cylinder. Finally the fresh coilover gets an injection of nitrogen to help the piston push its fluid harder, and it’s ready to be installed! The whole job is not particularly difficult or complex, the advanced engineering comes in when you’re figuring out how to dial in the valving stack and ride height the first time around. With this particular pair of Sway-A-Way shocks, you’d be at a solid starting point. We’ve just seen how valving is dialed in to a specific vehicle, but a pro-level driver will want it dialed in to their personal driving style. Mechanically it’s pretty much the same process, but instead of reading off a guidebook you need a technician who will know how certain changes will affect the shock’s performance, which shims to increase rebound and compression and such. “If you’ve got $1,000 to spend on power or suspension, give me the suspension and I’ll win every time,” AFE’s Leighton told me, excited. The ethos there is basically “balance over brute force.” As for perfecting that balance, he described suspension tuning as “more of an art that can be backed up by science” than a purely empirical exercise. Practically speaking, that means you have to try a few things out and ‘feel it’ before you know whether or not a certain setup is ready for primetime. So a lot of testing goes down in the desert, but AFE’s suspension shop is clean enough to do surgery in. With stacks and stacks of shocks and ancillary components filling shelves in various states of prep, everything’s organized, coded and labeled for easy reference. Knowing how a each stocked valve will affect a shock’s performance, AFE’s techs can rummage through their warehouse and adjust a suspension kit like a Lego set based on feedback from a test pilot. Comprehensive suspension builds can be as complicated as reorganizing an entire vehicle’s geometry with new control arms and rear-links positioning the axles, but as far as bolt-in shock upgrades you can make a lot of magic just by playing with what’s inside the cylinder. For the rest of you who don’t have money to blow on custom valving, at least you’ve seen the inside of a coilover. And I hope you have a better appreciation for the minutiae of what’s really going on behind those big bouncing springs!